European release by Walt Disney Records, distributed by Emi Records, Ltd. Published by Wonderland Music Company, Inc. (BMI) © Renewed. All Rights Reserved. Published by Wonderland Music Company, Inc. (BMI). All Rights Reserved. Published by Walt Disney Music Company (ASCAP). All Rights Reserved. 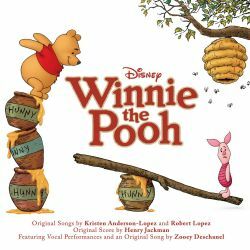 "Main Title Sequence/Winnie the Pooh"
Published by Walt Disney Music Company (ASCAP) All Rights Reserved.